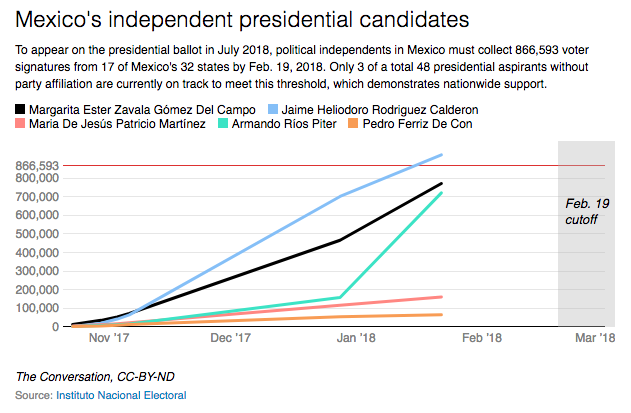 When Mexicans go to the polls to elect their next president in July, their choices will include — for the first time in history — independent candidates with no political party affiliation. Last fall, 48 independent aspirants threw their hats in the presidential ring, hoping to cash in on widespread anger at the Mexican political establishment. But only three currently have a credible shot of getting onto the ballot in July, all of whom have previous ties to one of Mexico’s three mainstream parties. 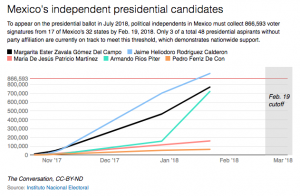 With less than a month left, Jaime “El Bronco” Rodríguez Calderón – the popular renegade governor of Mexico’s northern Nuevo León state – looks likely to meet the signature threshold by the Feb. 19 deadline. Also well on their way are Margarita Zavala, the wife of former president Felipe Calderón, and Sen. Armando Ríos Piter of Guerrero state. In the end, who makes it onto the ballot may have less to do with popularity than with Mexico’s incredibly user-unfriendly election smartphone app. Mexican law requires presidential candidates without party backing to obtain 866,593 valid signatures from at least 17 of Mexico’s 32 states. The signatures – which must be collected using the government’s new smartphone app – must represent at least 2 percent of registered voters in each of those states. And since, as one election official observed before the product’s launch, Mexico has more smartphones than copy machines, digital signatures seems like a clever, time-saving innovation over hard-copy petitions. It also aims to improve fraud detection. Instead, since its launch in October, the clunky election app has been the top complaint of political independents. They have a point: I’m a 34-year-old Mexican political analyst who got her first cellphone in college, but I struggled a bit with the multistep signing process. Just downloading the app is difficult. First, voters must contact the independent candidate they want to support. That candidate’s campaign then sends the person’s details on to Mexico’s National Electoral Institute, which in turn sends a set of identifying codes back to the voter. Voters may enter those codes to download the app – assuming, of course, they have a modern smartphone with an up-to-date operating system and enough available memory to temporarily store the personal information that will be sent on to the electoral institute. Many people don’t make it this far. Despite official online manuals and tutorials, only about 30 percent of voters registered to support an independent candidate have actually managed to submit signatures, according to the National Electoral Institute. Some candidates who seem unlikely to make the Feb. 19 signature-collection deadline are blaming the app for their underwhelming show of popular support. 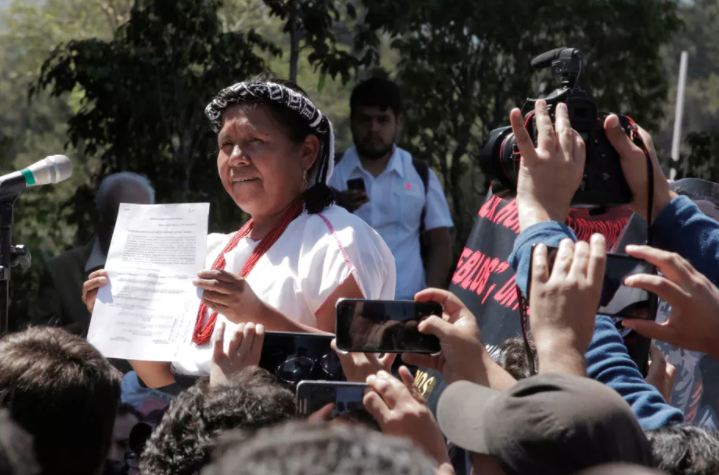 The indigenous nominee María de Jesús Patricio Martínez, who is currently ranked fourth among independents with 161,000 signatures, for example, says the digital tool is elitist. Mexico’s election app was “not designed for the poor of this country, but rather for the rich,” she asserted, noting that “many in our communities don’t even know” about smartphone technology. To set up an account on the app, supporters must have a Facebook or Gmail account. There may be over 60 million Facebook users in Mexico, but my mother-in-law – just to name one independent-minded voter – is not among them. And since she’s not a Gmail user, either, I had to log into my email account on her phone, then walk her step by step through the download and signature process. Critics say the app also disadvantages rural and poorer Mexicans. For example, though it is programmed to capture the front and back of the Mexican ID card, automatically extracting the photo and personal information, a subpar camera phone or low lighting can throw off the whole process. Voters must then manually enter their information. And since internet coverage and speeds vary dramatically across the country, many people in rural Mexico – who are also likely to have simpler cellphones with less storage – frequently have a trickier and much slower signing experience. Some snags were probably inevitable in the lead-up to the first federal election to include independents running for national office. Real political competition is relatively new to Mexico, which was ruled by the authoritarian Revolutionary Institutional Party for most of the 20th century. Early attempts to run for office outside the system were quashed. In 2005, Jorge Castañeda, a former Mexican secretary of foreign affairs, challenged his denied independent presidential bid at the Inter-American Court of Human Rights. It ruled in his favor, recommending that Mexico guarantee private citizens’ right to be elected to public office. A legal reform in 2014 made that possible. Today, Mexico has three mainstream political parties. But after a quarter century of corruption, executive overreach and persistent violence, voters aren’t particularly happy with any of them. That popular discontent explains why there are 48 independent presidential bids this year. In 2015, the first year independents could run for office, six came to power as senators, governors, congressmen and mayors. In 2016, they were joined by 10 more mayors and another congressman. That was all before the app. After independents began complaining early this campaign season that their supporters were struggling to complete their digital signatures, the National Electoral Institute released an upgraded app. Launched in November, the new version offered improved camera detection, increased security and faster upload speeds. The government also allowed paper signatures in 283 “high-deprivation municipalities” with limited internet access and granted a one-week extension to all candidates running for federal office. On Jan. 13, yet another app version was released, this one designed to be supported on a wider array of devices. Though upgrades may improve signature gathering, they make more work for independent campaigns. Every time a new version comes out, it erases all existing records, so campaign volunteers must hasten to send Mexico’s electoral board all their prior signature batches before the release date. Mexicans won’t know until Feb. 19 if their preferred independents have made the ballot. If they don’t, my guess is they’ll have an app to blame for that.